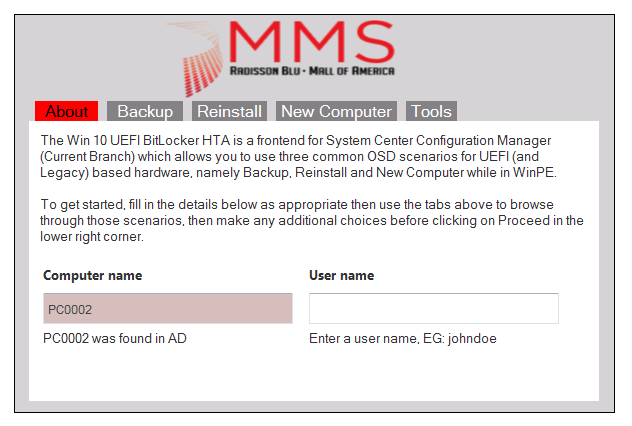 Introducing the Windows 10 UEFI BitLocker Frontend for System Center Configuration Manager (Current Branch) | just another windows noob ? 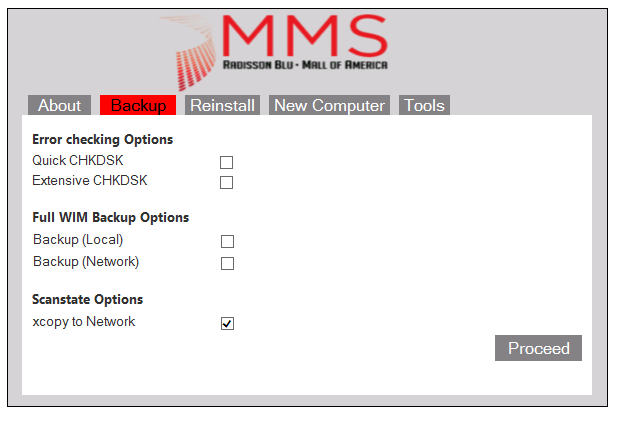 At MMS in Minnesota today I demonstrated the latest version of the windows-noob frontend which has been customized with the color and branding for MMS. 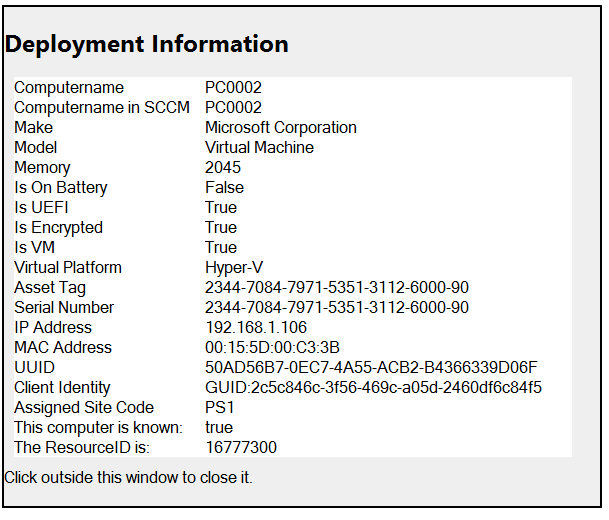 This time it has evolved to support System Center Configuration Manager (Current Branch) version 1602 or later, using UEFI (or legacy capable) hardware offering the ability to migrate your computers to Windows 10 including a new ability to detect what language pack is installed and secure XTS algorithms. The reinstall computer allows for automatic detection of language pack installed, and if found will automatically reinstall the correct version of language pack for the target operating system (for example when migrating from Windows 10 1507 to Windows 10 1511). 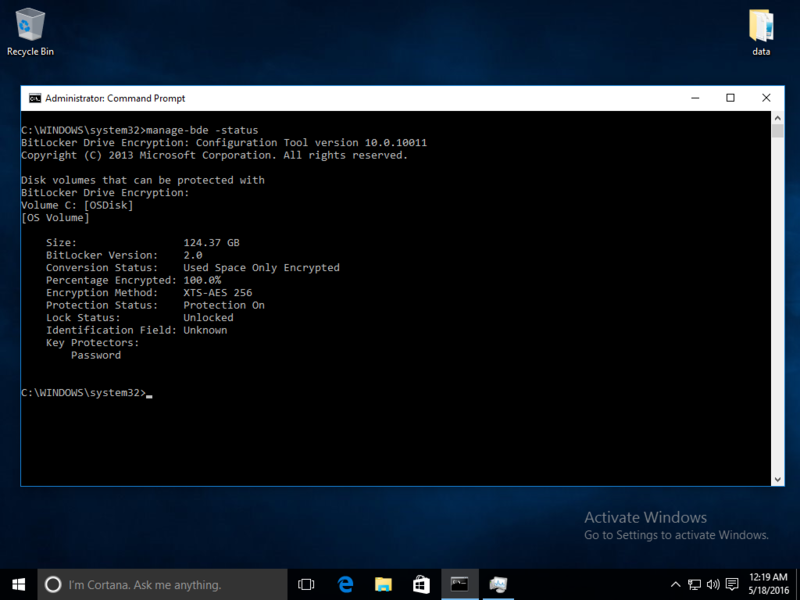 The New computer scenario offers XTS encryption algorithms which is a new (more secure) BitLocker ability in Windows 10 1511.
you can review Deployment Info including whether it’s encrypted or not, and if the device is UEFI or Legacy. To download the updated content, use the following zip. Note: there’s a bug with the XTS encryption algorithms explained here. 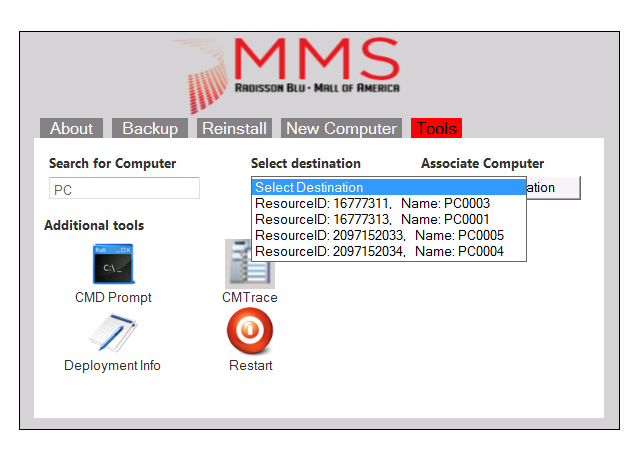 A rough guide for installation is here (for the previous release, just replace the MDT and Windows versions with what this frontend supports in the download above. 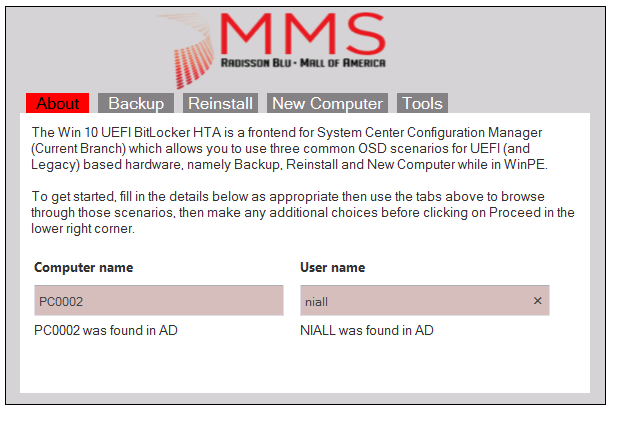 This entry was posted in 1602, MBAM, MMS 2016, System Center Configuration Manager (Current Branch), Windows 10. Bookmark the permalink. Hey, just a heads up. 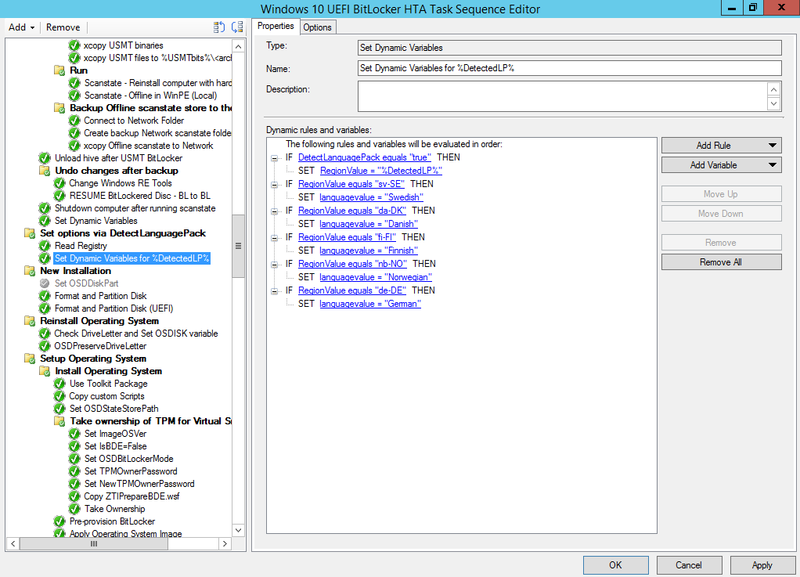 Your deployment.hta needs an adjustment for the ‘Reinstall’ to work. I just noticed you had this updated version, as I literally just set up your Version 4 last week, then saw you link to this post in the thread. Stared at the smsts.log for a minute before I figured out what was going on! Line 441 has onclick=”Backup()” as well. 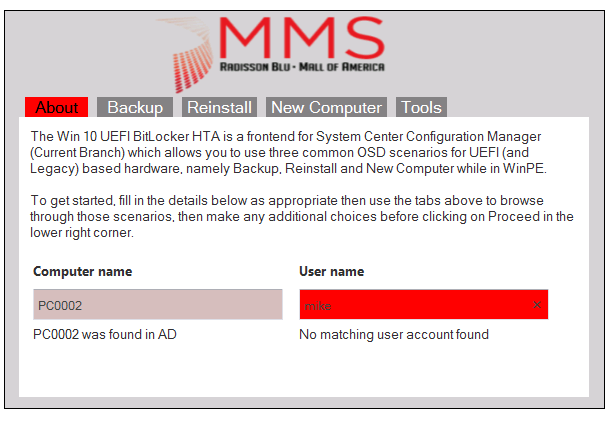 Pingback: Why is the Windows 10 1607 reinstall in PXE scenario failing for BitLockered UEFI enabled Lenovo computers ? | just another windows noob ? 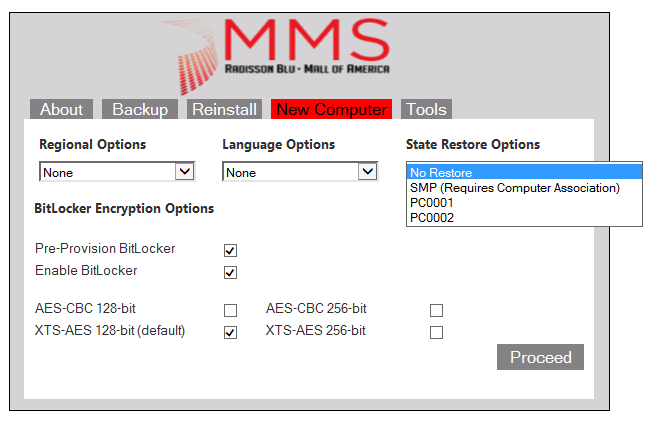 Pingback: Why does the Bitlocker recovery key not end up in the MBAM 2.5 SP1 database when using XTS encryption | just another windows noob ? 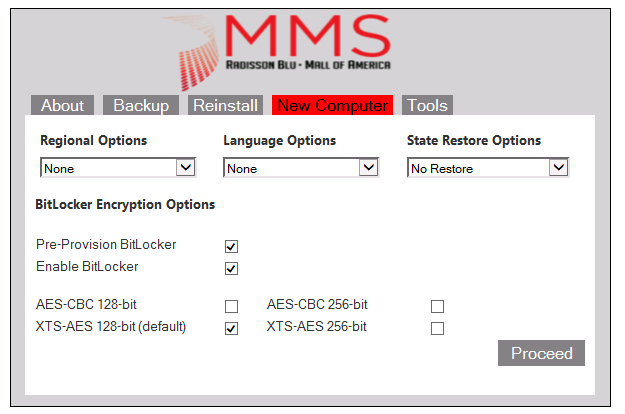 Pingback: The CM12 BitLocker FrontEnd HTA | just another windows noob ?